Delray Beach Real Estate and homes for sale in Delray Beach. Delray Beach is a special place and is known as the Village by the Sea. It is a coastal city found in Palm Beach County with over 60,000 residents. Delray Beach offers a unique feel this is ideally located conveniently between West Palm Beach and Ft. Lauderdale. Search all homes for sale just like an agent. Our free, one-step registration allows you to bookmark your favorite houses, save searches and receive emails as soon as new homes in Delray Beach come on the market. There are many options when it comes to Delray Beach Homes. Here are a few popular housing types. Delray Beach is home to many restaurants, nightclubs, art galleries and plenty of shopping. It's also home to many tourist attractions including world famous beaches, the Downtown Delray Beach area, "The Avenue" and the Downtown Arts District. Tourists come to see the Delray Wreck, which is a great spot for scuba diving and snorkeling. Along with the amenities, Delray Beach is home to the Delray Beach International Tennis Championship, which is a popular event found on the ATP World Tour 250 series. The event is held at the Delray Beach Tennis Center every year. Due to the amazing nightlife, shopping and dining, USA Today Travel named Delray Beach as one of "America's Most Fun Small Towns" in 2012. Recently Delray Beach was nominated by Coastal Living as the Third Happiest Seaside Town In America. Even though it is quite an honor, those that call Delray Beach home, would differ. We would say it is the Happiest Seaside Town in America. The downtown area provides most of the attractions with plenty of cafes, restaurants and shopping options. There is even a new IPic Movie Theater coming in our future. This is also the area where you will find "The Avenue," which is known as one of the most popular streets in the city. 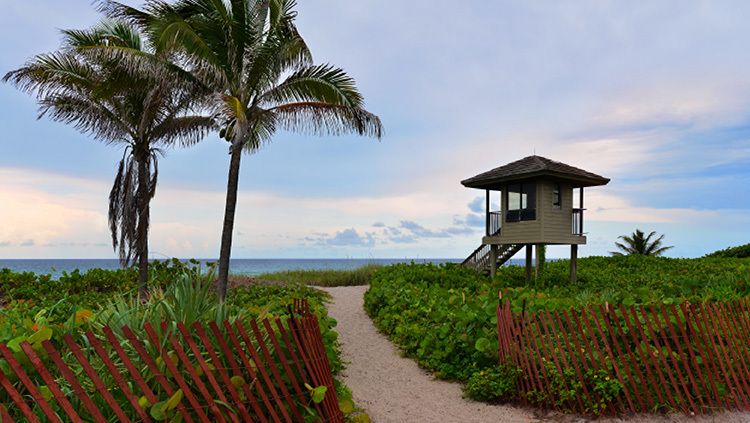 Of course, the main reason to settle in one of the many Delray Beach communities is for the year-round sunshine and the amazing beaches. The area is known as "Florida's Village by the Sea" and provides plenty of beautiful beaches on the crystal clear Atlantic Ocean.